1. 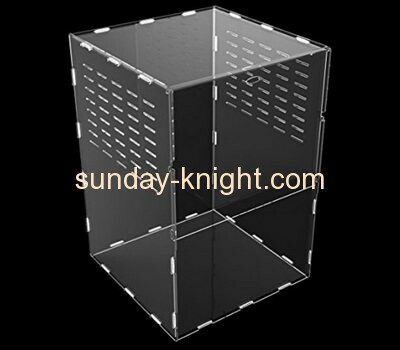 Item name: acrylic fish breeding box. 2. Material: acrylic/ lucite/ PMMA/ plexiglass/ perspex. 3. Size: custom size available. 5. Craft: laser cutting, polishing, printing, bending, water milling, gluing. 6. Color: clear/ black/ red/ blue/ white/ grey/ frosted or any other colors. 7. Delivery time: 25 working days or depends on the order quantity. 8. Sample time: 5-7 working days. 9. Logo: silkscreen,printing,laser engraving,etched,gold or silver stamping. 10. Packing method: individually in polybag, then into a inner box, several boxes into a master carton or as customer's request.